The Phuket Amateur Golf Week 2012 teed off with sunny skies and the event went down to the wire with just 3 stableford points separating the top three players over 4 rounds. 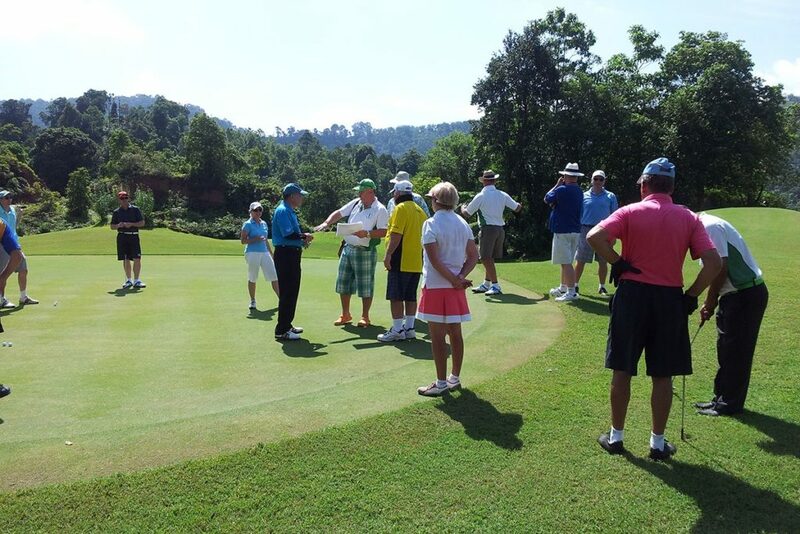 Each July golfers from all over the world converge in Phuket for the Golfasian Thailand Amateur Golf Week. This year was no different with golfers from UK, Singapore, Australia and Germany testing their skills on the Phuket championship courses. Day 1: saw Francis Lee from Singapore jump out of the starters blocks with a fabulous 44 points at Loch Palm golf club and he was quickly relieved a few shots off his handicap. This great course has plenty of water and bunkers in play and is a popular course for the local players. Day 2: saw Mel Lemke shoot 39 points to take the honors on a day where winds played havoc with the players. A 15 minute shower before play had made the greens a little slower and the majority of the field had better scores than on the previous day. Maybe they are just getting warmed up? After a rest day on Tuesday where some of the players decided to play an extra round at Red Mountain, some went off to the nearby island for some fantastic sightseeing and some chose to nurse a headache by the pool from sins from the previous night’s activities. Day 4: saw the field up nice and early for the round at Blue Canyon (Lakes Course) and the players were greeted with great weather and greens running at 11 (for us golfing nobodies do we really need to know this?). What I found out is 11 is quick as my second putt whizzed by the hole on the second green. It’s always a pleasure to play golf courses that have names such as Greg Norman, Fred Couples and Tiger Woods on their Honors Board. Doug Taylor from the UK had 43 points and moved up the leader’s board heading into the final day. Day 5: With the top 4 players being seeded in the last group, Francis Lee from Singapore, Doug Taylor from the UK, Simon Hopwood from Sydney, Australia and Gary Mitchell from Brisbane, Australia. The Australians were hoping that one of their own could get over the line after watching Adam Scott falter on the finishing line and hand the trophy to Ernie Ells. The final round was played at Red Mountain, one of the most picturesque golf courses in Thailand and a fitting course to be the last day of the Phuket Amateur Golf Week. The winner on the day was Jan Doyle with a great 38 points. Jan and husband, Winston had been in Phuket for the week prior and had been practicing all week and it finally paid dividends for Jan.
For the overall result, going into the last nine holes it was anyone’s match to be won and after the scores were tallied up Simon Hopwood was the winner from Jan Doyle in second place and Francis Lee taking third place. Doug Taylor took out fourth place and Bart Bourgeois took out the scratch honors. The group had a farewell dinner and prize ceremony at the Destination Patong Hotel and many vowed that they need to return next year to master some of the courses that Phuket has. Go here for a full list of all Thailand Amateur Golf Weeks.